4 potted seedlings, which I had acquired from Jeff Morris (Spencer NC) earlier that day. Jeff had grown the 4 seedlings from the autumn 2011 seed harvest of Jack Johnston. All four had germinated in spring of 2013 and were ready for planting out. 20 seeds from the 2013 harvest from the Clinton NC tree (to germinate). 20 seeds from the 2013 main harvest (via Jack, received by Jim later). Yesterday I finished planting the four Torreya seedlings you gave us. The area where I planted them is entirely wooded. There are many large trees, some with base diameters of perhaps three feet. Most of these have only high limbs. Judging by the leaves on the ground, the trees are maple, oak, tuliptree (Liriodendron), and others I can't identify. I will try to figure out more of what is there next summer. 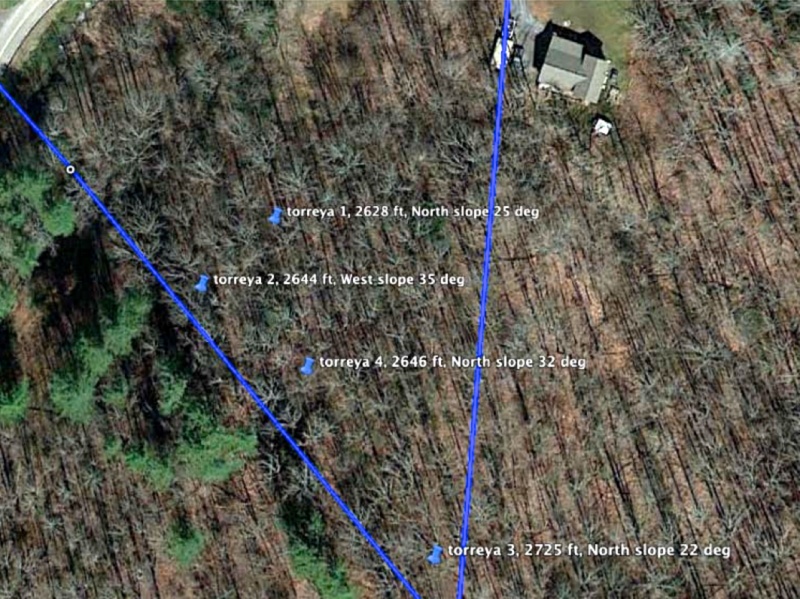 There are also a number of large pine trees (perhaps white pine) on the southwest boundary of the property. I noticed a few small hemlocks perhaps 8 feet tall. There are several large rhododendron bushes perhaps 20 feet in diameter and 15 feet high. 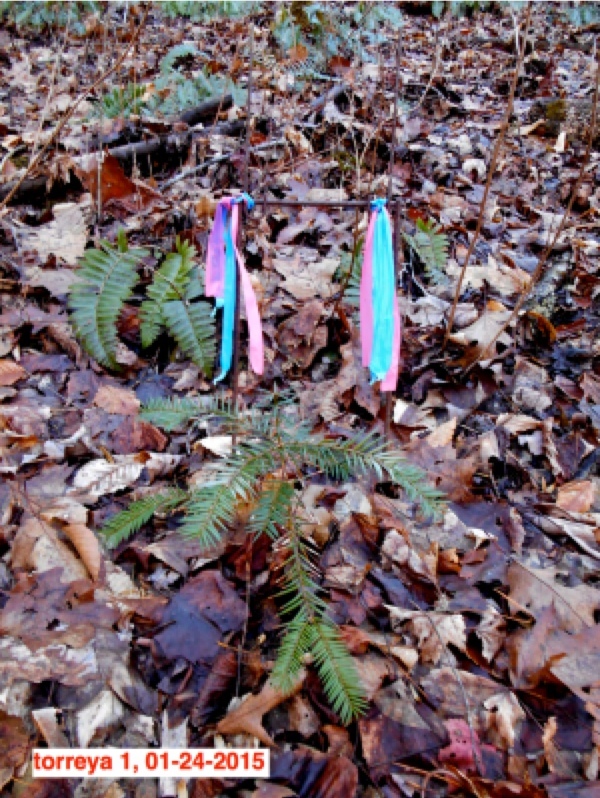 ABOVE PHOTO: (Torreya #3) I marked each plant with blue and pink tape on a wire frame up-slope from the plant so that it can be located visually in the woods. I also recorded the elevation and location with my GPS (within about 10 feet), crudely measured the slope using a level, roughly determined the direction the slope faced using a compass, and took pictures. Torreya #3 is on a more open slope of about 22 degrees under the canopy of trees facing North or slightly West of North at an elevation of about 2,725 feet. (I say "about" when I mention any of the elevations since I am not sure how accurate they are, even though the elevation was measured with the GPS. If I take more than one GPS reading at the same location, the elevations come out slightly different. Also various GPS readings are not consistent with the values on the contour map we have of the property.) Torreya 3 is the largest of the four plants you gave us, about 12 inches tall. I found that it had the most developed root-ball when I removed if from the pot. ABOVE PHOTOS: Two views of Torreya #1 on left. Next are Torreya #3 and Torreya #4. Torreya #1 is on a slope facing a little West of North at an elevation of about 2,628 feet with a slope of about 25 degrees. The left-most photo of it shows at the photo top the greenery of a large rhododendron. Torreya #2 is on a slope facing a little North of West at an elevation of about 2,644 feet on a slope of about 35 degrees (or perhaps more). There is a ridge between Torreyas 1 and 2. This slope has more rocks than the Torreya 1 slope and has more undergrowth, perhaps because it gets some late afternoon sun through the trees. (The picture was taken about 4:30 PM.) There are a lot of ferns in the areas of both Torreyas 1 and 2. Torreya #4 faces almost due North and is probably the most protected of the four plants. It is on a slope of about 32 degrees at an elevation of about 2,646 feet. Torreya #4 is located on the right face of a slight valley between two ridges. The slope is indicated by the fallen trees in the picture. The left face of the slight valley can be seen in the upper left part of the picture. The green trees seen in this area are a bunch of small pine trees (maybe 8 to 10 feet tall) between Torreya 4 and Torreya 3. 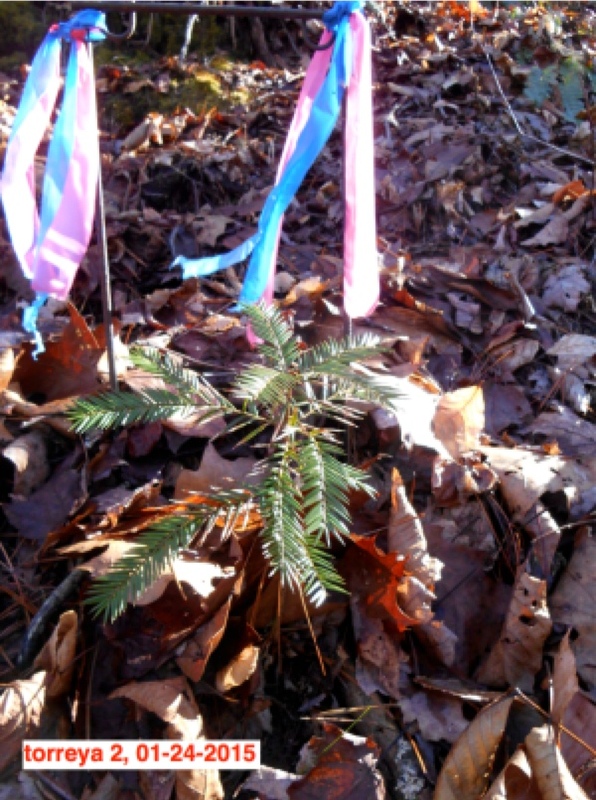 Note: Torreya 4 is too small to see in this photo; the greenery to the right of the ribbons is a fern. Report of the 4 Torreya seedlings planted in 2013: They were doing well the last time I checked, which was several months ago. 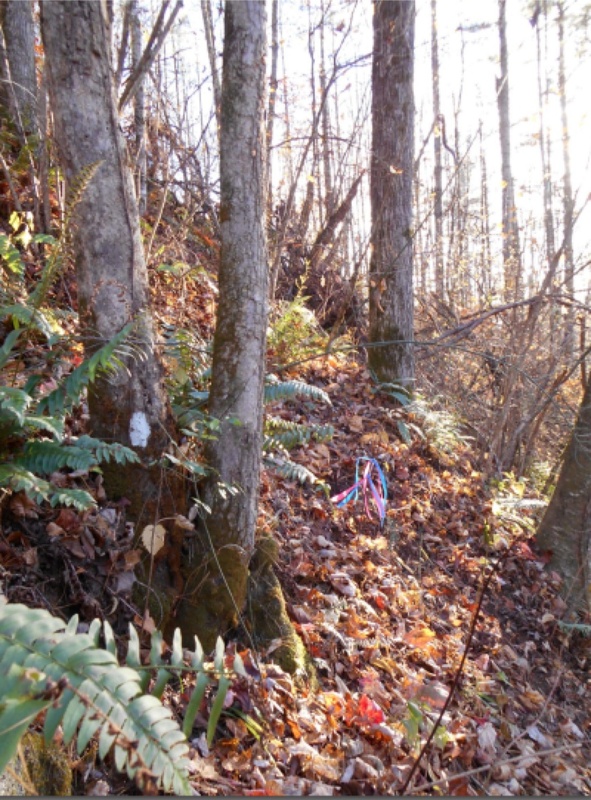 They have been hard to find and difficult to get to because of the underbrush. I will try to check them again and take some pictures this week or next. 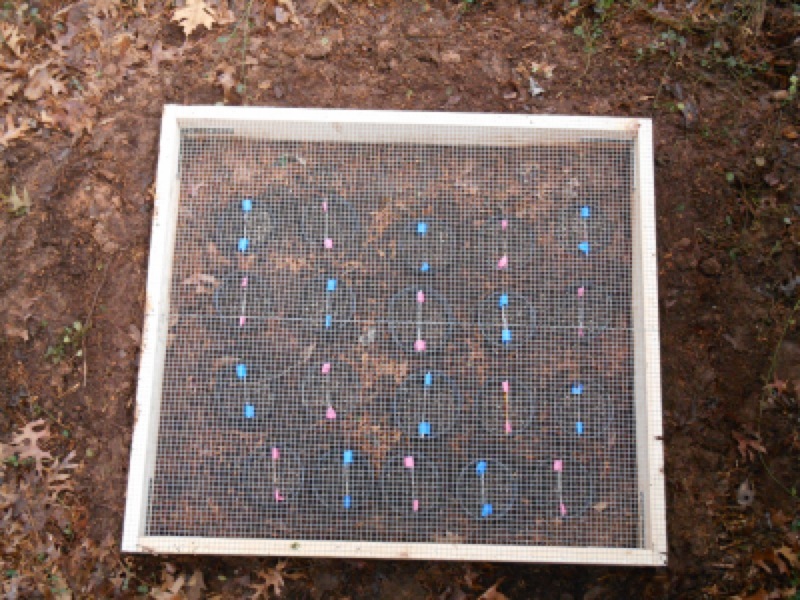 PHOTOS ABOVE: 40 seeds (planted 2 to a pot) in December 2013. Pink tape = 20 seeds from the Clinton NC tree (delivered by Connie). 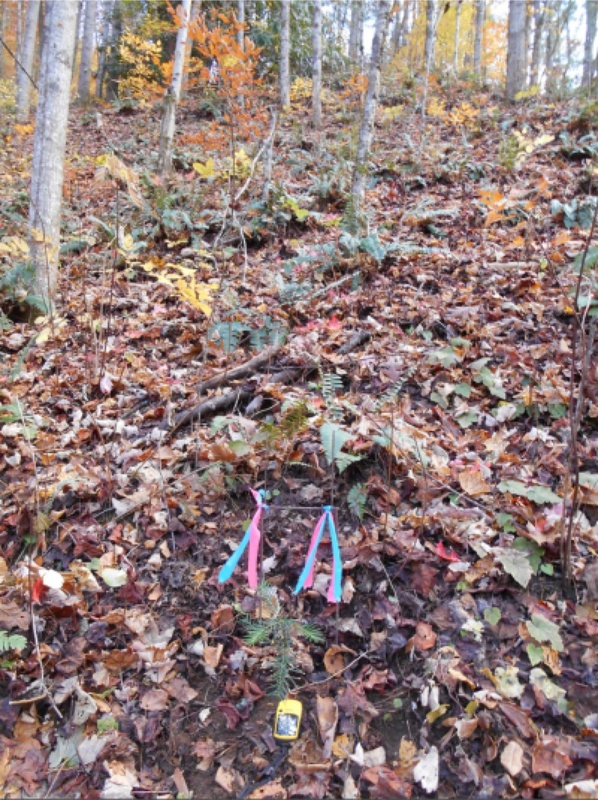 Blue tape = 20 seeds from main 2013 harvest (via Jack). 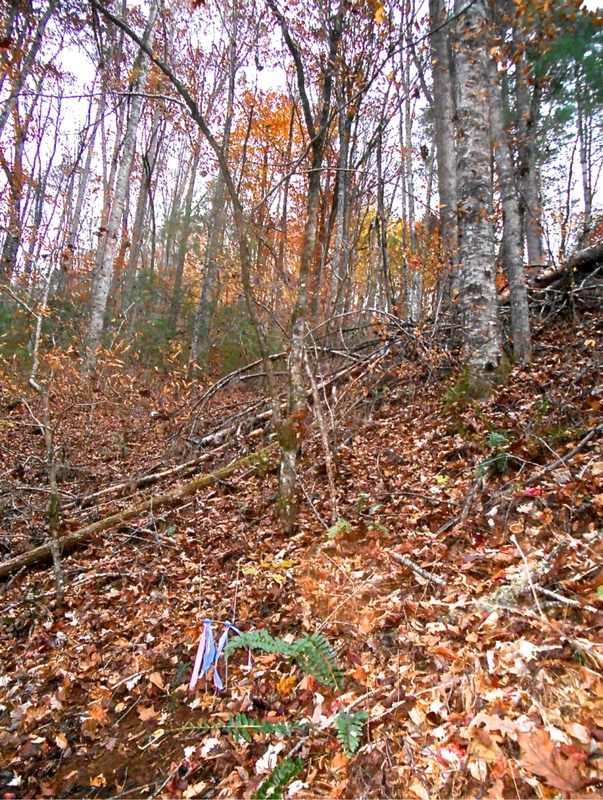 This wild forest site on Jim Thomson's property east of Cullowhee is the first location where Torreya Guardians have had access to a north-facing mountain slope (elevation 2,600 feet). Connie Barlow films and narrates this field survey, led by Jim Thomson. 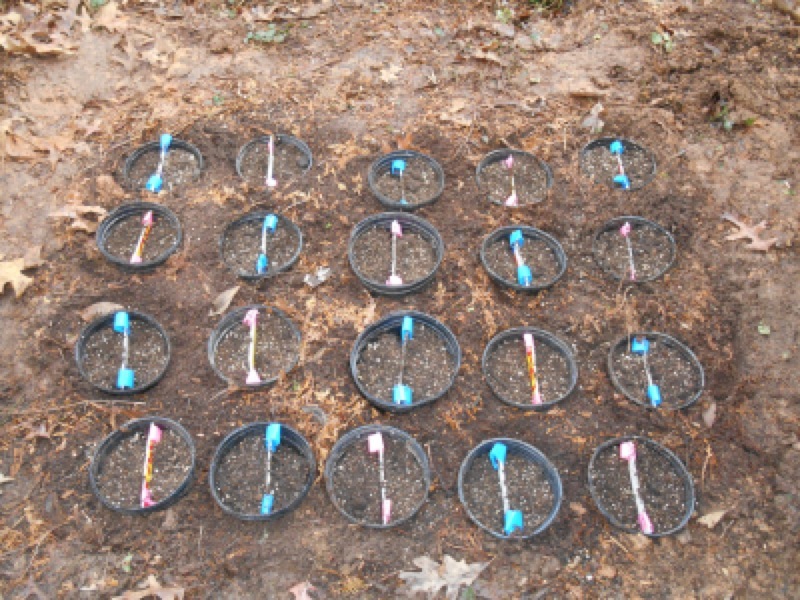 Here they observe the 4 Torreya taxifolia seedlings that Jim planted 18 months earlier. The original big-needled leaves are seen here to be dying back, but shorter needles are the growth form that this cool, shady location seems to call forth. 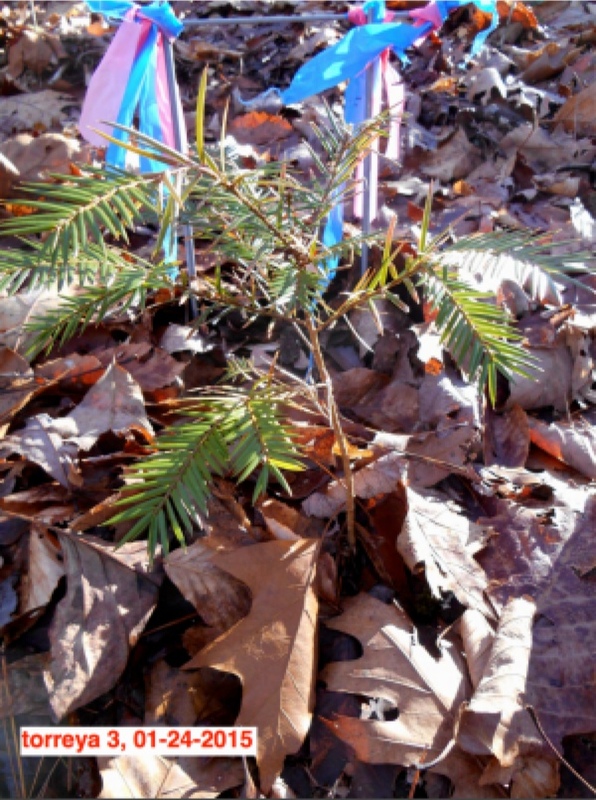 CONNIE BARLOW reports: Spring 2016, I helped Jim plant 6 of the potted seedlings he had nurtured from seeds given him by Torreya Guardians December 2013. 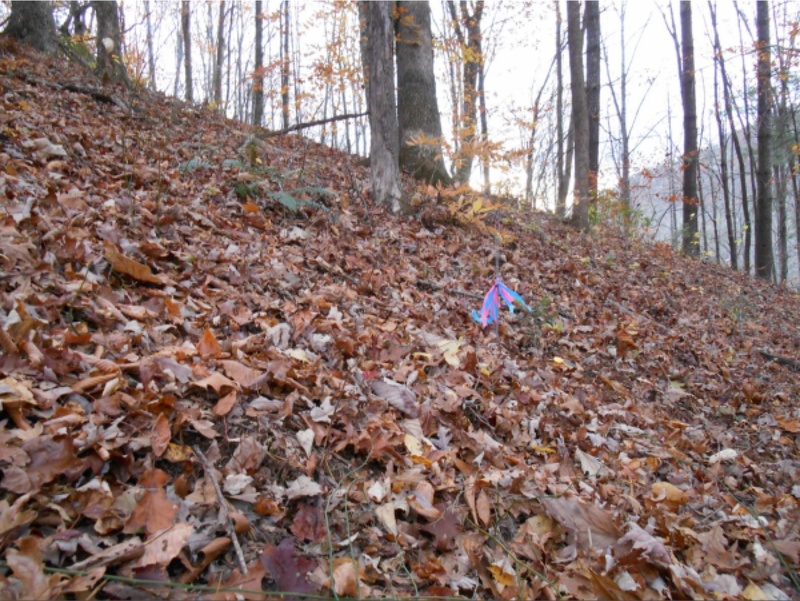 We planted them on the flats of his Cullowhee property (3 very near the road and 3 very near the upslope forest edge). 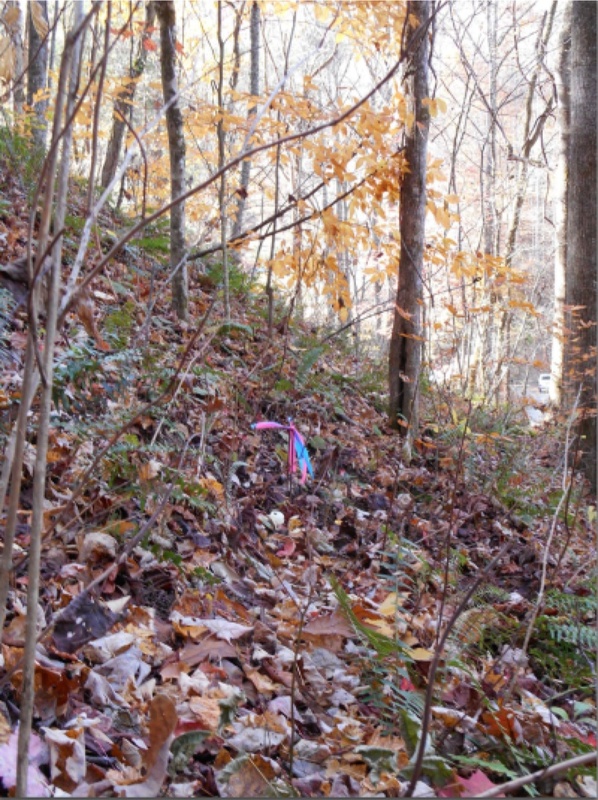 This is in contrast to the original donated seedlings (see Nov 2013 report above), which he planted beneath a mature deciduous canopy that is steeply upslope from his home in Cullowhee. I took video of our Spring 2016 planting but have yet to edit and post it on youtube. JIM THOMSON REPORTS: I checked on the six torreys that we planted last spring. Five of them seem to be doing fine, but one is turning brown and some of the stems have fallen off. I have nine more Torreya plants at my house in Waynesville that should probably be transplanted next spring.